The Nissan ESFLOW will go from 0 to 60 in less than five seconds and travel 150 miles on a full charge of its lithium ion battery pack. The sports car concept uses the same battery system as the Leaf. NASHVILLE -- Just two months into selling its family-oriented Leaf electric sedan, Nissan Motor Co. is floating the idea of an electric hot rod to go with it. The company has released images of the ESFLOW, a rear-wheel-drive two-seater powered by electric motors in its back wheels. The vehicle will appear next month as a concept car at the Geneva motor show. Officially, there is no plan to produce the sports car. But Nissan has provided a fair amount of performance detail for a car that is merely a design exercise. According to the automaker, the ESFLOW will go from 0 to 60 in less than five seconds and travel 150 miles on a full charge of its lithium ion battery pack. The sports car concept uses the same battery system as the Leaf, which went on sale in limited U.S. cities in December. But according to its EPA-rated fuel economy, the Leaf can promise consumers only 73 miles on a battery charge. The company maintains that the range will be closer to 100 miles in many driving conditions. But the considerable difference between the Leaf and ESFLOW comes from body weight. The more aerodynamic ESFLOW uses an aluminum chassis and is about 1,000 pounds lighter than the four-door Leaf. The battery pack is positioned at the center of the chassis to give it equal weight distribution for better handling. The concept boasts leather and suede seats, and other sports-car cues inside, but carries long headlights similar to those on the electric family car. 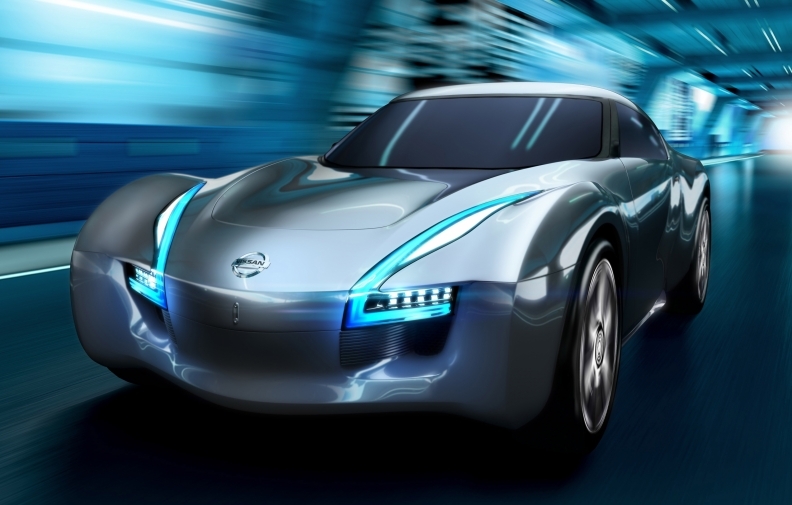 Nissan CEO Carlos Ghosn has promised a portfolio of electric-only vehicles for his dealers. But until now, only two other future models had been identified for production: a four-passenger vehicle for the Infiniti brand, based on the Leaf platform but using a different design; and an electric commercial van that presumably would be sold by the 250 or so Nissan dealers who have agreed to market the company's commercial vehicle line. Nissan is in very limited production of the Leaf this year and will have limited production next year because of global production constraints in Japan. U.S. retailers will be allocated just 20,000 vehicles a year for both years. But in late 2012, the company will start mass production of the Leaf and its batteries in Smyrna, Tenn. The company says Smyrna will yield 150,000 Leafs a year and 200,000 battery modules after that.